All our product is base on license key that is unique for each PC. It's NOT Transferable!. Please make sure you are confirm on the production PC before make the system installation or configuration. We are not using any DONGLE or Always On Internet Checking mechanism for key activation. If you need to know our product price, you may request it online. No worry. Request for quotation does not mean you have to buy it. Purchase our MYKAD SDK + READER package and save RM50! Value for money for small project implementation. We support Windows XP until latest Windows 10. 32 or 64 bits. You just need .NET framework installed! Web application. Problem with Windows 10 64bits? 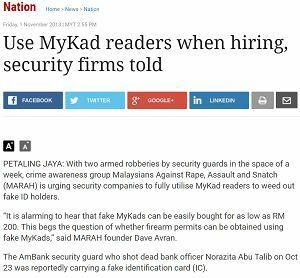 If you have problems with your current MYKAD Reader SDK from other companies due to Windows 10 update, do contact us. We are developers and willing to share with you our solutions. Due to high request for MYKID SDK, we had recompiled and update our MYKID SDK and ready to use. You can use it for your students management system or clicnic application. We have DEMO/TESTING license key for our developers. Request for it if you need to use it temporarily. *You need to purchased our hardware in order to get the DEMO/TESING license key. If you need to CHECK IN and CHECK OUT get our MYKADCapture else get our value for money application MYKADCapture Lite for RM500 only. If you need to save your customer information, do get our mySTAFF apllication else get our ready to use application mySTAFF Lite. 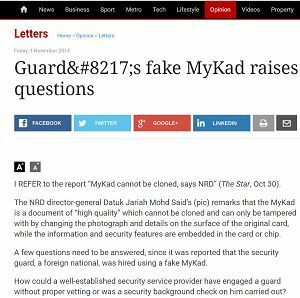 Good enough for you to verify thumbprint and print to PDF format or send to printer for MYKAD owner signature. Get our LITE version and SAVE RM1000! IE only or ANY Browser? Our MYKAD SDK support IE only for web application implementation. If you need to use Chrome, Firefox or Internet Explorer get our #10:OPENWEB - UNLIMITED. BARU! Jam Solat bagi kegunaan surau dan masjid. Paparan waktu solat, slides show, jadual kuliah dan count down. Ianya MUDAH dan MURAH. Mini PC + mySolatime software. Cuma perlu ON sahaja. Auto Start.